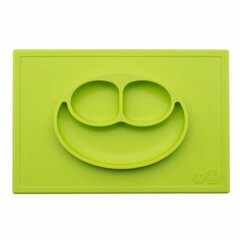 Here comes the small dish mat in bowl form of ezpz in the color lime green! The small oval place mat TINY BOWL is absolutely safe on the table and other smooth surfaces, so the children's plate can not fall off the table. This innovative combination of placemat and children's plate is a practical solution for small people. Fruits, vegetables and other goodies fit perfectly on the plate. Very easy to clean, because the plate mat can be simply put in the dishwasher. The shell measures 22,9x16,5cm and is 2,8 cm high. If several children are together, 3-4 mats with the finished food can be stacked on top of each other and brought to the table. If you want, you can use the ezpz silicone bowl TINY BOWL in the microwave if necessary. Super handy for traveling and can be easily stowed away. It also fits great on the little tables of the Stokke Tripp Trapp high chairs.